We must have been a strange sight. Four women, two tents and a 4X4. 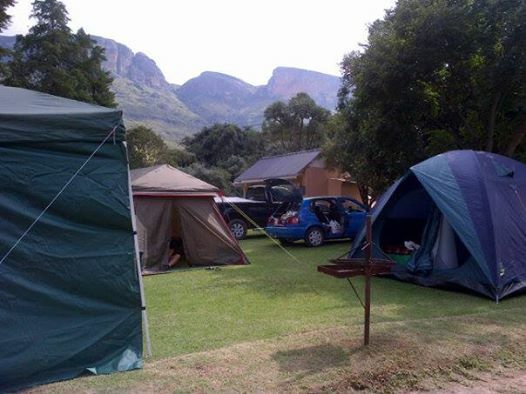 The campsite certainly kept an eye on us the entire long weekend, as my friends and I made our home for the three days on a patch of lawn in the Royal Natal campsite. We know that they kept an eye on us, because several of our fellow camp dwellers told us that they did! We put the tents up in record time, as a well-oiled machine, even though one of the tents had come straight from the shop. Women read instructions, you see. The lady from the south side of the campsite remarked how quickly we had put the tents up. We had a gazebo too, that formed a shelter from the elements, and was a relaxing place to put our chairs. Not that there were many elements to contend with. The weather was mercifully fine, and we had the added advantage of an amazing campsite. It was covered in velvety green grass, right near the kitchen and bathroom facilities, and with its own little White Stinkwood tree for shade. It was such a perfect campsite, that an elderly couple (who had also been watching us) begged for the use of it once we had left. Their site was in the sun the entire day, and they had noticed that some part of our camp had shade at all times. The lady from up by the fence was watching us, as well as the man from the tent by the pine forest. They commented on our fire-making abilities, and offered advice. We used our instinct though, when it came to keeping a fire going in the stiff wind that sprung up on Saturday night. A combination of shielding the flames with a car sunvisor, gentle blowing and a few extra coals ensured that our fire was still ready to carry on partying when we were ready for bed. And it gave us the best toasted marshmallows ever! One of our neighbours even remarked on our delicious smelling food. Someone was watching one of us dropping cigarette stompies in a neat pile next to one of the chairs. We came back from a walk to the Cascades, to find that all the stompies were sealed neatly in a Ziploc bag. Obviously that person was concerned about the cleanliness of our site. Our nightly 30 Second games were observed by the rest of the campers as well. They were somewhat amused by the fact that we played it in the kitchen next to the sinks. Well, there was a plug point to charge cell phones, and we were in a non-electric site. The man next door must have been watching us too because when we were packing up, he rushed to our aid with a device to take tent pegs out with. And at least we provided entertainment for the rest of the campers as well!